Persimmons and beets come in to season just about the time Thanksgiving rolls around. This salad combines the two with a few other ingredients to create a fantastic salad for fall dinners. The sweetness of the persimmon, the earthy deliciousness of the roasted beets and garnet yams with a salty note from the cheese and pepitas is perfection when topped with the blood orange vinaigrette. 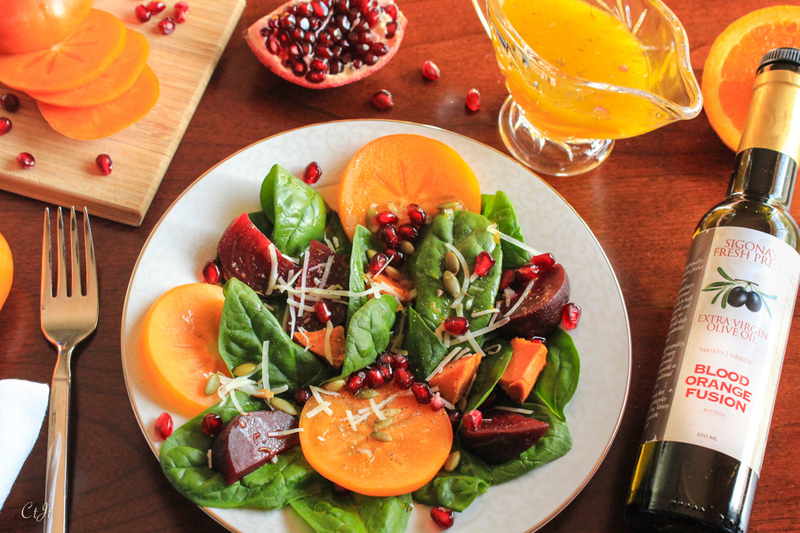 Orange and beet pair well together, so the vinaigrette brings the whole dish together. Inspired by Low Carb Maven. Serves 4. Directions: Divide the spinach among 4 individual salad plates or bowls. Tuck 2 to 3 slices of the persimmon around the spinach then add the wedges of beet and cubes of yam/sweet potato. Top with grated cheese, pepitas and pomegranate arils. In a medium bowl, add the zest, juice, balsamic and shallot. While whisking, drizzle in the olive oil and mix until emulsified (thickened). Season to taste with thyme, salt and pepper. To serve, lightly dress each dish with vinaigrette or serve it alongside. *To roast beets: Preheat oven to 400°F. Scrub the beets and trim off the root and stalk ends. Save the greens for another purpose, such as salad or garnish. Wrap each beet individually in foil and place on a baking sheet. Roast for 50 to 60 minutes or until they can be easily pierced through the center with a fork. Remove from the oven and allow to cool to the touch. Remove from foil and rub off the skin. They’re now ready for use. **To roast cubed yams/sweet potatoes: Preheat oven to 400°F. Toss the cubes with a little olive oil, salt and pepper. Spread out in a single layer on a rimmed baking sheet lined with parchment paper. Roast for 25 to 30 minutes, or until fork tender, stirring half way through.